I am a self-professed control freak. I think I’ve always been that way. It can present a variety of problems – especially when you try to wrap your mind around the fact that the big guy upstairs has a plan for you that you have no control over. For years, my prayers were always about God making the things I wanted to happen happen. 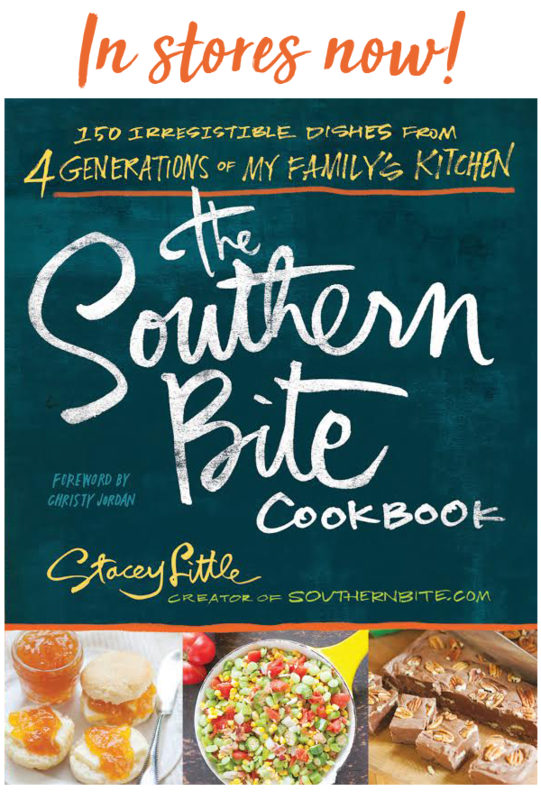 But when I look back over the last few years and my experiences with Southern Bite, I realize that I never set out to do nearly any of the things that I’ve been able to accomplish. The blog started as a way for me to share some family recipes and a few restaurant reviews to a very local audience. Now, we have millions of page views every month from people across the globe. 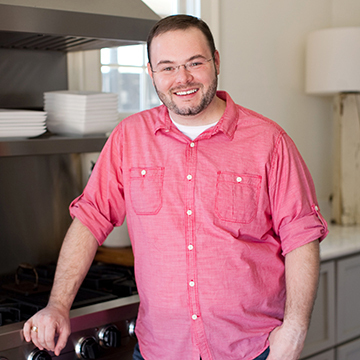 I never ever considered writing a cookbook, but I got to do that too. I say all this because I realized that God’s path for me was quite a bit different than what I could have expected for myself. But that path has allowed me to meet some amazing people and have some incredible experiences – and hopefully reach a few folks with a positive and uplifting message. Since all these realizations, my prayers have changed a bit. My prayers are no longer asking for one particular thing to happen, but for God to lead me down the path He has set for me. Now, they sound less like, “Dear God, please give me the opportunity to write another cookbook,” and more like, “Dear God, if your plan for me includes the opportunity to write another cookbook, please show me that path and offer me the strength, patience, and understanding to do so.” You see, there are never unanswered prayers. Sometimes, no answer is the answer. You might find yourself praying profusely for that new job. But when you don’t get it, it’s not God telling you no. It’s God telling you, “I’ve got something even better in store for you!” For me, I was struggling with my own faith and trust in God and his ability to plan for and guide me. It’s a hard pill to swallow for us control freaks, but once I had the realization, my relationship with God is much different. For me, it’s no longer about getting what I want, but more about following the path he’s set out for me. And it’s been my experience, following that path can lead to some pretty amazing things. 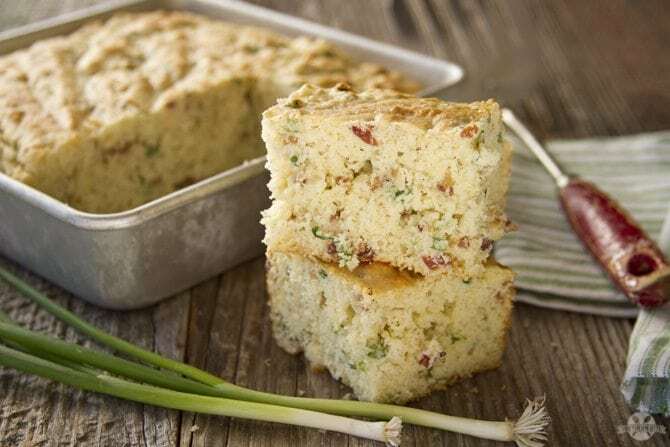 Y’all this Bacon Green Onion Cornbread is TO DIE FOR! It’s certainly a new favorite at our house. I just know it will be at yours too. 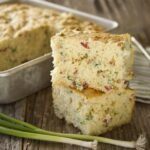 It’s the perfect hearty cornbread you expect, but it’s filled with tons of flavor from the green onions and bacon. And we all know what bacon does… 🙂 Y’all enjoy! Preheat the oven to 400°F. Coat an 8x8 baking pan with nonstick cooking spray. (This can also be cooked in a 10.25 cast iron skillet. Simply coat the skillet with vegetable oil at this step). Whisk together the cornmeal, four, and salt. Add the eggs, vegetable oil, buttermilk, and sour cream and stir until just combined. Add the green onions and bacon and stir to combine. Pour into the greased pan and bake for 25 to 28 minutes or until golden brown. Allow to cool slightly before slicing and serving. You have found a sure path to contentment. We can in strength and wisdom when we heed God’s plan for us. Listen to your heart, appreciate what you have, and always give thanks. Best wishes to you and yours for a blessed 2015 year. Thanks, Nana! You, too! Stay warm!! That should have said gain in strength. Either my brain or my PC is frozen. We had wind chill close to negative 20 this morning. Thanks for this post, good reminder for me today. I love your cookbook and I hope you get the opportunity to do another. A beautiful humble sharing of your journey. I came across this the other day; thought you would appreciate it. When we pray God hears more than we say, answers more than we ask, gives more than we can imagine, in His own time and His own way. Amen, Linda! SO true! Thanks for sharing that. Please tell me what do I add to “plain” cornmeal/wheat flour, to make it “self-rising”?? This sounds absolutely wonderful. I am due to make a lunch meal for my work bunch and this will go with the Chili Hominy recipe that I am going to make just perfectly. Can’t wait to try it!!! Sounds like a perfect pair!! Enjoy! Your creativity is so apparent in your writing also! You have really nailed it about “letting go and letting God”! Everyone who knows you is not surprised at the paths you are traveling! Hope 2015 is just as wonderful! Thanks so much! Thanks to you for helping to instill courage and confidence! I got your cookbook for myself for a Christmas present. Made the scratch brownies last night. OMG – I agree with your family, I don’t know that I will ever buy a mix again! I had all of the ingredients on hand where a mix would have required a trip to the grocery store and my family had just requested brownies the day before your cookbook showed up. Perfect timing! Normally I do not care for made from scratch brownies if that is possible not to like a brownie. I honestly thought the mixes were better until I got your cookbook, saw your recipe and your comments. Yeah, my family was in total agreement. No more mixes for us. I might have to double the recipe next time – that pan didn’t last very long! Making another pan tonight! I want to try the turnip greens and cornbread dumplings. Well, really, I want to try all of them! Love the cookbook! I just love simple but down home good recipes that us plain folks can understand and cook with normal ingredients!!!!!!!!!!! LOL! That’s fantastic! I’m just tickled y’all enjoyed them so much!! Wonderful, uplifting post! God is using you in a mighty way! 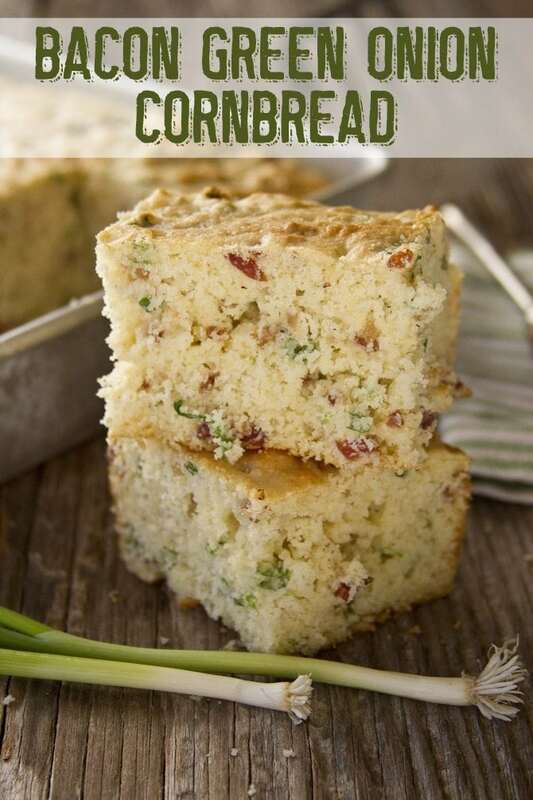 We love cornbread and this recipe looks amazing! Yep, it’s just the bacon. Enjoy!! Stacey…..I think I could eat half of that recipe in one sitting. YUM!! Will have to try it sometime. I just about did! 🙂 Enjoy! You should be able to find self-rising cornmeal on the dry ingredients aisle of your grocery store next to the flours and such. It seems a lot of southern cooks us self rising flours. Can you please give measurements for those of use who are northern cooks who would like to make your recipes without spending money on ingredients that will go bad before we use them? To make your own, combine 1 cup of all-purpose flour with 1 1/2 teaspoons of baking powder and 1/2 teaspoon of salt. Great cornbread! We enjoyed it with some beef stew and we will be making it again! Thanks!! So, if you load up a hushpuppy batter with bacon, corn, onions, jalapenos,cheese and etc – do you have to call it a fritter??? Such a beautiful story. Thank you for sharing. That, indeed, is a very hard lesson to learn. How wonderful it is when we can finally let go and let God! It took me years to get there, and I still struggle and try to take control!! Old habits die hard!! I can’t wait to try this recipe!! That’s so true, Pam! I sure hope you’ll enjoy!